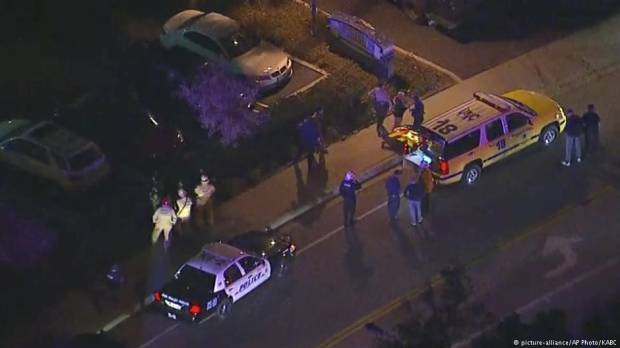 Thirteen people are dead, including a sheriff's deputy, and at least 10 more wounded after a shooting Wednesday night in a bar in southern California. The gunman used a handgun and smoke bombs at a country dance bar on "college night" and sent hundreds of panicking people toward the exits, with some breaking windows to escape, authorities and witnesses said. Ventura County Sheriff Geoff Dean said that sheriff's Sgt. Ron Helus, a 29-year veteran of the sheriff's department, responded to the scene and was shot after he entered the building. He died at a hospital early Thursday. The gunman, identified as a 28-year-old Marine Corps veteran, was found dead inside the bar. "It's a horrific scene in there," Dean said early Thursday in the parking lot of the Borderline Bar & Grill. "There's blood everywhere." There was no immediate information on the wounded victims' conditions. There were hundreds of people inside the Borderline Bar & Grill in Thousand Oaks at 11:20 p.m. local time, and shots were still being fired when deputies arrived, authorities said. Wednesday night was "College Night" at the bar and the place was packed with a young crowd. President Trump on Thursday said on Twitter that he has been "fully briefed on the terrible shooting." He praised law enforcement, saying "Great bravery shown by police" and said "God bless all of the victims and families of the victims." Ventura County Sheriff Dean said police did not know if the shooting was linked to international terrorism. "Nothing has led me to believe or the FBI, there is a terrorism link here," he said. "We certainly will look at that option." Several people from inside the bar have told television reporters that a tall man wearing all black with a hood and his face partly covered first shot at a person working the door, then opened fire, seemingly at random, at the people inside. 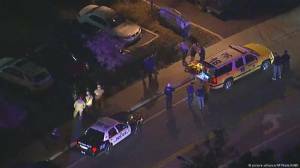 According to the nonprofit Gun Violence Archive, there have been 306 mass shootings in the United States in 2018, not including Thursday's in Thousand Oaks, a city of about 130,000 people about 40 miles (64 kilometers) west of Los Angeles.